Search engine optimization is the process of improving the visibility of a website to search engines. While that is a simple idea, putting SEO concepts to work can seem daunting to a beginner. Luckily there are a number of SEO tutorials to get started. Here is a list of SEO tutorials for beginners. There are comprehensive guides, as well as shorter quick-start tutorials. There are SEO overviews, SEO blog tutorials, a SEO video tutorial, and a SEO case study tutorial. All of the tutorials are free. 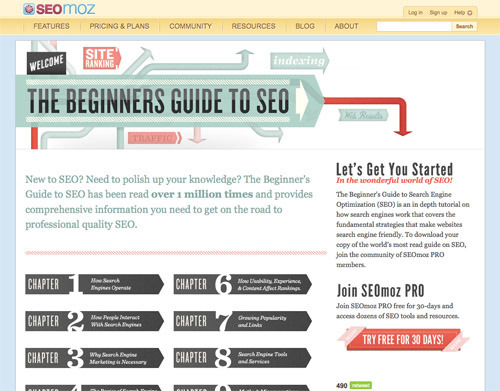 “The Beginner’s Guide to SEO” from SEO management platform SEOmoz is an in depth tutorial on how search engines work. It covers the fundamental strategies that make websites search engine friendly. Topics include how people interact with search engines, keyword research, myths and misconceptions about search engines, and measuring and tracking success. Access the tutorial online for free, or download the guide by joining SEOmoz PRO for $99/month. “Search Engine Optimization Starter Guide” is a best-practices guide PDF download available on Google’s Webmaster Tools page. The document began as an effort to help teams within Google. 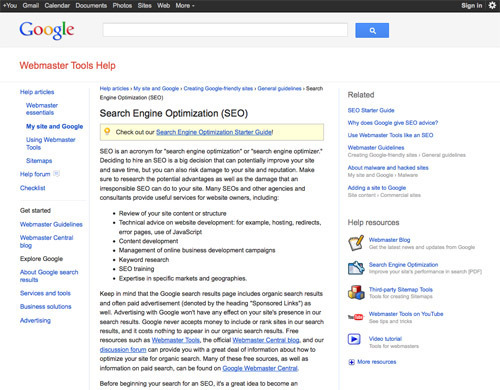 It outlines how to make it easier for search engines to crawl, index and understand site content. 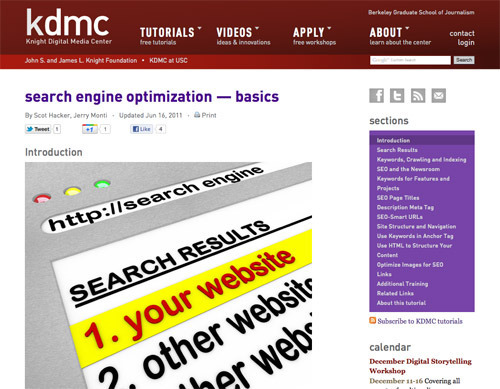 “Search Engine Optimization — Basics” is a tutorial from the Knight Digital Media Center, housed jointly at the Berkeley Graduate School of Journalism and the University of Southern California Annenberg School for Communication. The tutorial features sections such as keywords, site structure and navigation, optimizing images for SEO, additional training, and related links. 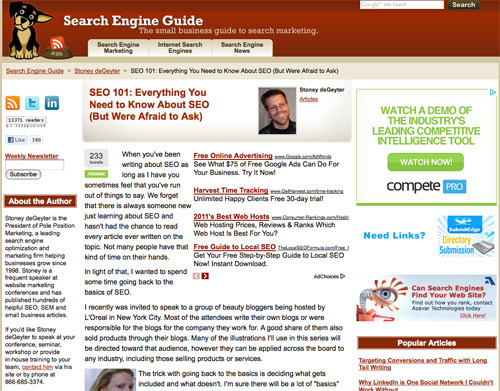 “SEO 101” is a tutorial by Search Engine Guide, an online magazine for small business SEO. The guide is a fifteen-part series on the essentials of SEO. The series covers SEO basics, title tags, meta description and keyword tags, site architecture, keywords, SEO copywriting, linking, and more. 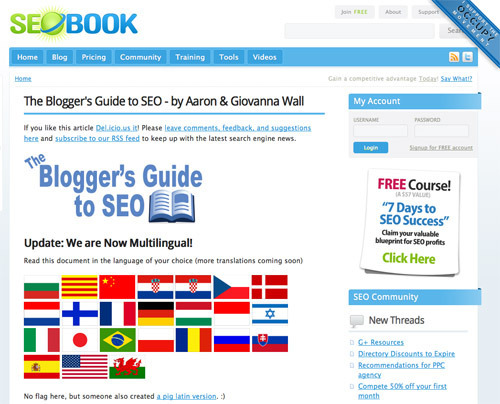 “The Blogger’s Guide to SEO” from SEO Book is a tutorial on SEO for blog sites. It explains why blog SEO is different from SEO for other websites. It also features sections on keyword research, optimizing site structure, web analytics, and lists additional links to learn more about SEO. 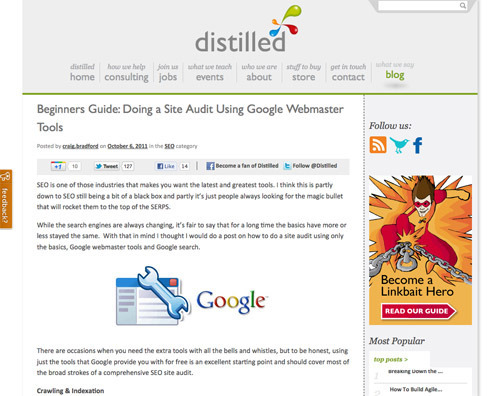 “Beginners Guide: Doing a Site Audit Using Google Webmaster Tools” is a tutorial by SEO agency Distilled. The tutorial focuses on using the free tools that Google provides as a starting point for a comprehensive SEO site audit. 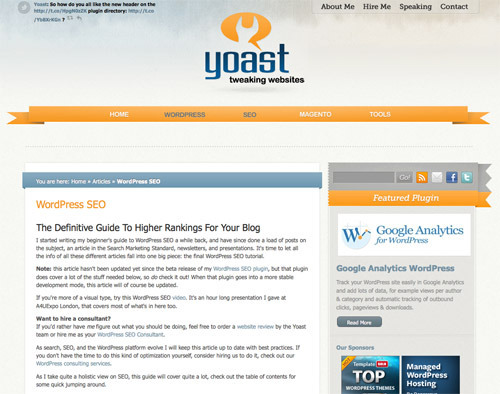 “The Definitive Guide To Higher Rankings For Your Blog” from Yoast is a comprehensive WordPress SEO guide. The content is also presented in video presentation. 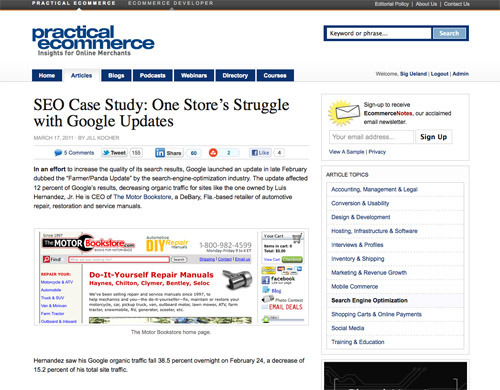 “SEO Case Study” is a Practical Commerce series from Contributing Editor Jill Kocher — an SEO professional — on the SEO struggles of The Motor Bookstore, a retailer of automotive manuals. Kocher writes frequent articles for Practical eCommerce on SEO topics that help merchants and web developers, respectively.